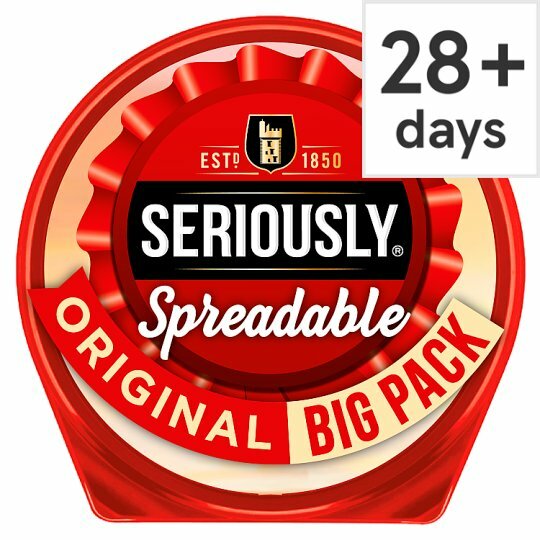 Seriously® Spreadable Original offers the delicious taste of our Seriously® Extra Mature cheddar in a convenient and creamy texture, making it very easy to spread. It is made with award-winning Scottish cheddar specially selected for its characterful and distinctive flavour. Enjoy it spread it onto crackers for a seriously tasty snack or in sandwiches as part of a light meal. There's cheese spread, then there's Seriously®. Made from pasteurised cow's milk. Keep refrigerated:, Use within a week of opening., Best before: See bottom of pack. Produced in France with cheddar produced in Scotland using UK milk.